Honduras should amend its domestic law to ensure that police use of a firearm is restricted to situations where it is necessary to confront an imminent threat of death or serious injury or a grave and proximate threat to life. No one shall be subjected to torture, or to cruel, inhuman, or degrading punishment or treatment. Every person deprived of his liberty shall be treated with respect for the inherent dignity of the human person. Everyone has the right of peaceful assembly, without arms, in a public demonstration or temporary assembly, in connection with their common interests of whatever nature, without the need of notice or special permission. Outdoor meetings and those of a political nature may be subject to a system of special permission, with the sole purpose of ensuring public order. The National Police is a permanent professional institution of the state, apolitical in the partisan sense, of a permanent civil nature, charged with safeguarding the preservation of the public order, prevention, control, and fighting crime, protecting the safety of people and their property; to execute the resolutions, provisions, orders, and legal decisions of the authorities and public officials, all with strict respect for human rights. The National Police shall be ruled by special legislation. Given the level of armed violence in Honduras, the armed forces as well as the national police are still engaged in law enforcement. In its 2017 Concluding Observations on Honduras, the Human Rights Committee called on Honduras to "continue to strengthen the national police with a view to enabling it to take over law enforcement functions from the armed forces". In carrying out its functions, the National Police must always make a progressive, differentiated, proportional, equitable and gradual use of force and weapons. 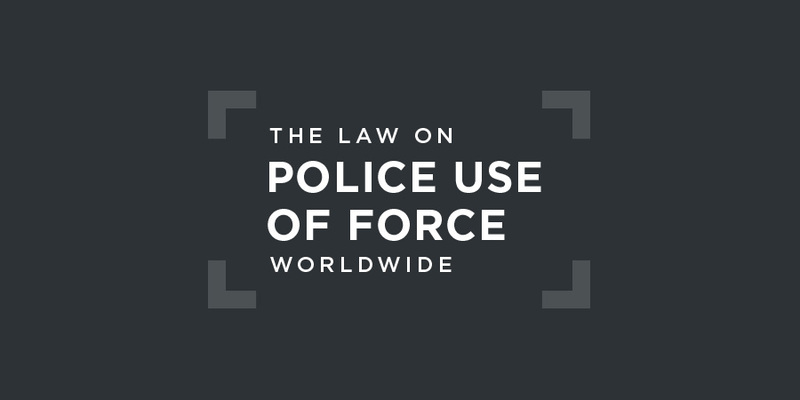 The use of force is considered legitimate, only when it is used to the extent strictly necessary for the effective performance of police functions respecting human rights and with the purpose of restoring public order. The use of firearms is legitimate only when there is a serious, imminent or rational risk to the life or physical integrity of the members of the Police Career, of a detainee or of third parties and in a dissuasive manner when there are reasonable grounds to assume that there is a serious disturbance of public order or is necessary to prevent the commission of a crime and other effective and less dangerous means are not available, as well as to repel an attack in the circumstances established by the Criminal Code, according to the causes of justification and causes of inculpability that are applicable to the case. This is more permissive than international law allows, which restricts police use of a firearm to a situation where it is necessary to confront an imminent threat of death or serious injury or a grave and proximate threat to life. Under the new Organic Law, a new Office of Police Disciplinary Affairs has replaced the Office for the Investigation and Evaluation of the Police Career (DIECP), which was not authorized to take disciplinary action. The DIDADPOL will focus exclusively on the investigation of misconduct by both police officers and employees of the Ministry of Security. It will issue technical opinions that oblige the Ministry of Security to oversee appropriate disciplinary action. In March 2018, the Office of the UN High Commissioner for Human Rights published a report that stated that the Honduran security forces, in particular the military police, used excessive – including lethal – force to control and disperse protests that erupted following the disputed presidential election of November 2017. The report found that at least 22 civilians and one police officer were killed during the protests. Of these, at least 16 people, including two women and two children, were shot dead by the security forces. The report also documents the killing of 15 individuals in the run-up to the elections, including party candidates, municipal councillors and activists.